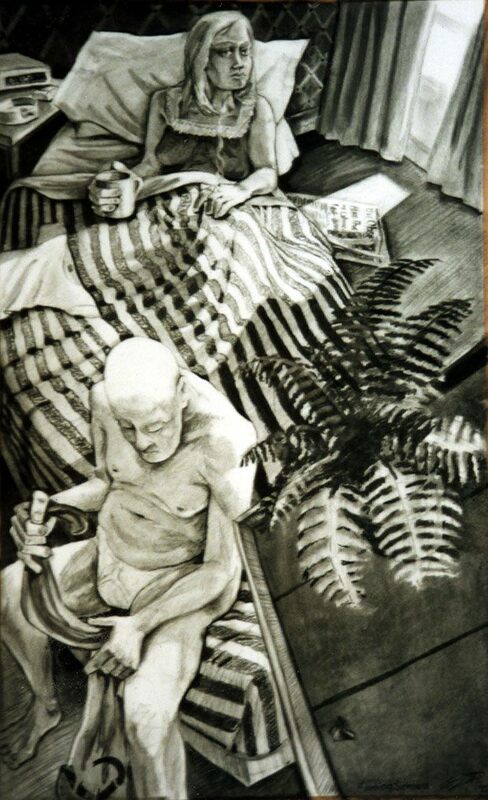 In this work, ‘Where’s me Bloody Socks – Morning Sickness’ to give it it’s full title, we see a man sitting at the end of the bed apparently getting dressed whilst a woman sits up in the bed with a mug of tea or coffee, staring out, away from the centre of the picture and towards the light breaking the gloomy darkness of the room. Gary likes to bend the perspective of the picture giving us the feeling that we may be a “fly on the wall” looking down from above the wardrobe. Indeed many of these drawings feature flies or moths, themselves symbols. As in the other drawings in this series there is more than one story embedded in the work and the artist sees himself in the man and the woman and also in the fly.